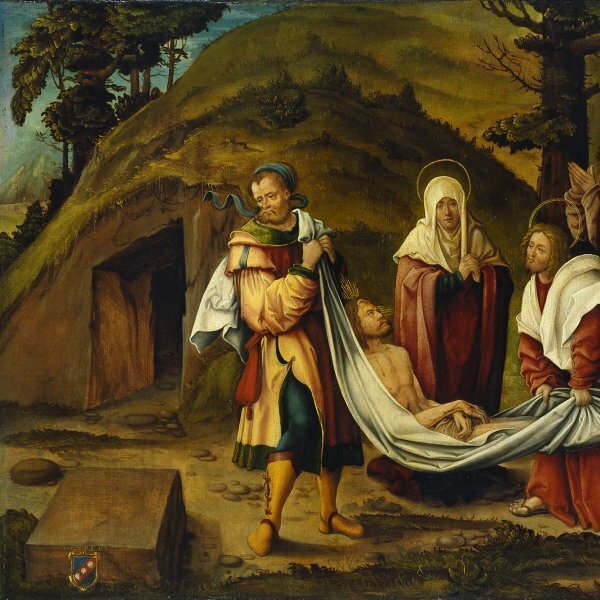 Barthel Bruyn was the most important artist in Cologne during the first half of the 16th century. Throughout his career he devoted himself primarily to religious painting for chapels and altars and to portraiture. In the latter genre he developed a distinctive style that was well received by his patrons and clients. Little is known of the artist’s early years and training or where he was born although his date of birth is known from an inscription on a medal. Despite this it is clear from his earliest production that he was influenced by Netherlandish painting both in his compositions and figures. Bruyn’s style also reveals echoes of Italian Mannerism which arrived via Italianate northern painters such as Martin van Heemskerck and Jan van Scorel, and via the engravings of the Italian printmaker Marcantonio Raimondi. Bruyn is documented in Cologne in 1515. Two years later he began to play an active role on the City Council. He occupied various posts and was intermittently involved with its activities throughout his life. Among his first commissions was a panel of The Coronation of the Virgin, while in the 1520s he painted the altarpiece for the high altar of Essen cathedral. The present panel of The Nativityhas been dated to around 1520. Its composition and the figure types reveal elements characteristic of Netherlandish painting that Bruyn skilfully blends with his own style. The principal motif in the scene is the Christ Child who occupies the centre of the panel. Arranged in a semicircle around this smiling baby who looks at his mother is the core group within the composition. In contrast, Saint Joseph occupies a secondary position, as is traditional in this iconography, raising his hand to remove his hat in a sign of respect. The angels are arranged in two groups, one of four figures on the right and the other of three, presented frontally behind the manger. The angels play and sing while the three nearest the manger amuse the Christ Child. One of the most successful elements in the composition is the space in which the main episode takes place, as well as the backdrop and setting. Here Bruyn displays all his abilities in the soft landscape created with a limited but carefully thought-out colour range. It includes the episode of the Annunciation to the Shepherds on a low hill on the right and a series of small figures that hurry to arrive at the place where the Christ Child has been born. To increase the sense of space in the panel Bruyn used a Mannerist device that he had already deployed in other compositions in the form of the shepherd in the middle ground who advances towards the central group and whose figure acts as a linking element to reinforce the connections between the most distant planes and the nearer ones. 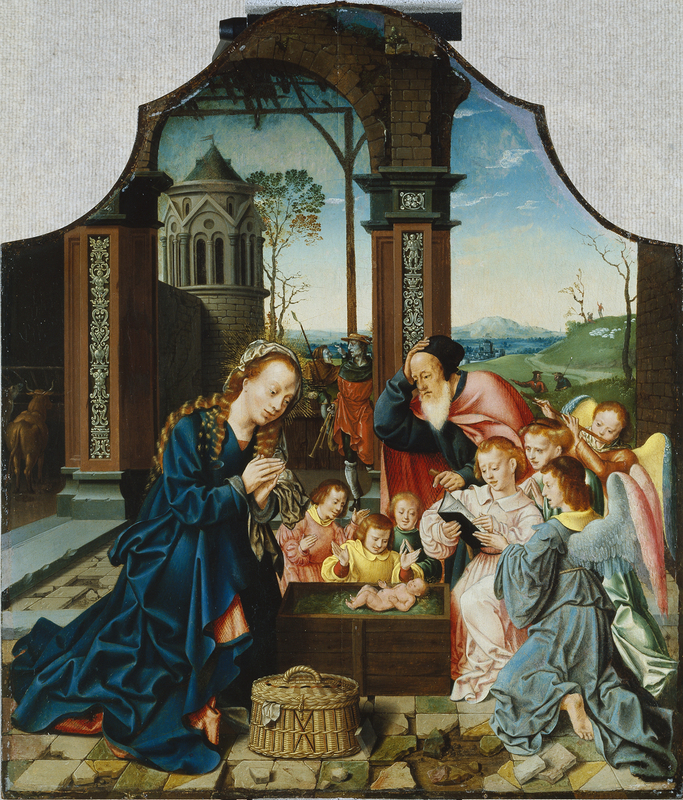 The painting has been compared with two more panels by Bruyn on the same subject: one in the Essen altarpiece in which he again included the pilasters that frame the dilapidated arch but with more ornamental details, and the principal scene in the triptych in the Kisters collection in which he organised a more complex distribution of the groups surrounding the manger. To judge from its size the present panel might have been the central panel in a triptych, but it could also be an individual composition. It entered the Thyssen-Bornemisza collection before 1930 and on the death of Baron Hans Thyssen-Bornemisza was inherited by his daughter Margit, Countess of Batthyány. It was acquired by Baron Hans Heinrich Thyssen-Bornemisza for the Collection in 1972.